Once you let me show you how to change the screen resolution in Windows 7 you will learn how simple it is to adjust. The higher the resolution the sharper the screen will be. 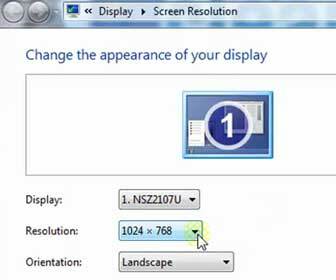 When you increase the screen resolution your Windows 7 desktop, icons and anything else displayed on the monitor will shrink in display size. In contrast, if you want to increase the size of your desktop icons and on-screen text you need to lower the resolution of your monitor. [adblockingdetector id=”2″]While you are at the display settings selecting a resolution you will notice that there are various ones to choose from. There is no right or wrong resolution. It is personal preference. I always try to find a high resolution that is sharp but not so high that all the icons, text and windows on my desktop are so small they are hard to see. On my laptop the resolution maxes out at 1680 x 1050 and that is what I prefer to use. My 22” CRT monitor at home peaks at the high resolution of 2048 x 1536. That is too high a resolution for everyday use. I set it to 1600×1200 which is a good medium for me. After you set your resolution it is important that you also adjust your refresh rate. The refresh rate is the number of times in a second the on-screen image from your computer is redrawn (aka “refreshed”). If the refresh rate is too low it can cause eye strain. So set the refresh rate to the highest possible setting that is compatible with your monitor. [adblockingdetector id=”4″]PLEASE NOTE: I get several variations of the same question asked a lot… “My refresh rate only goes to 60 Hz. I want to make it go higher. How do I do this?” The answer to this question is that either your monitor or video card does not support a higher refresh rate. Most likely your monitor is the bottleneck, limiting your refresh rate. There is no “fix” for your monitor, unless you want to buy a newer, a lot of expensive monitor.